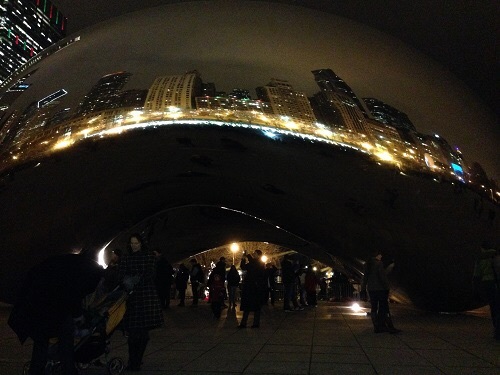 You can see the skyline at nighttime, reflected on its surface. Funny story – we actually went there to listen to a choir singing Christmas songs. This was supposed to happen every Friday in December from 6:00-7:00pm. By the time we got there at 6:45pm, people were leaving. Hmph. I know the website says that it might be shortened due to extreme cold, but it wasn’t that cold! Oh well. Maybe the next time we are in Chicago for Christmas. Here are some of the photos that we have taken on this trip (but only a few – not all of the photos are on the iPad yet). 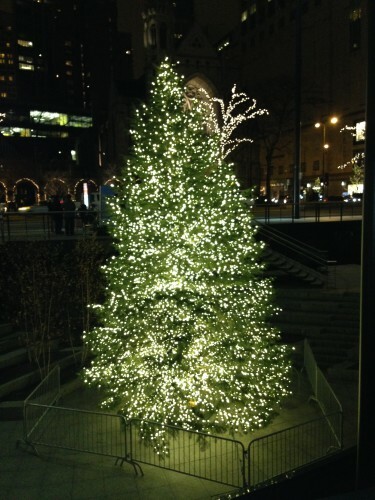 Above is a Christmas tree outside of the Best Buy in Chicago on Michigan Avenue. 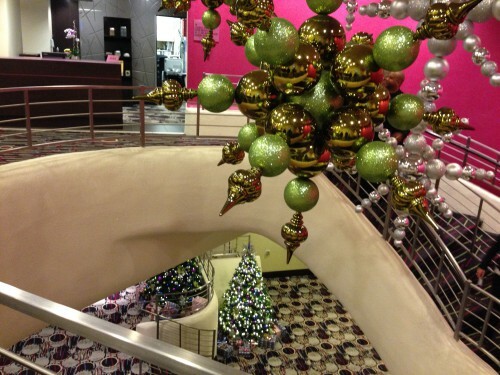 Above is a picture of the hotel lobby we stayed at, with Christmas decorations. Of course the advantage to this hotel is the warm chocolate chip cookies – that was all Marco and Roger talked about for months after booking the hotel. Of course we ended up getting chocolate chip cookies with walnuts but they’re testily very tasty so no one minded… Also funny: this hotel is right by Navy Pier but we didnt visit it at all (this trip anyway – last trip to the city we did). 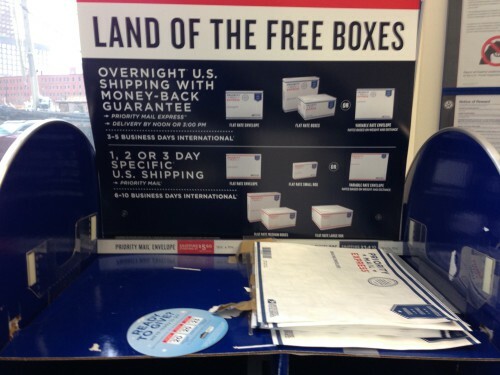 Here is a random photo of a post office display for flat rate boxes. You have various size boxes available and you can ship whatever is in that box for a flat rate (so a small box is always so many dollars, etc). Technically the boxes are “free” but it costs money to ship them. Marco uses these to send Dutch candy to a friend of ours in California. 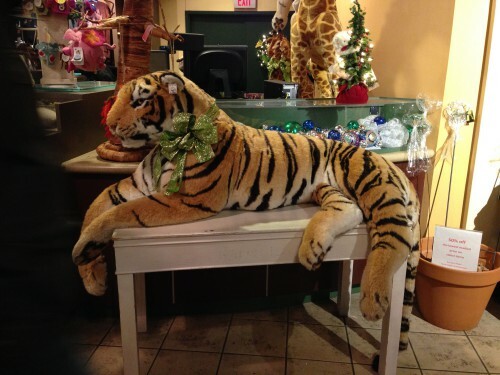 And here is something for Marco’s mother, who loves tigers. This was for purchase at the souvenir shop at Lincoln Park zoo. Sorry but it did not fit in our luggage! 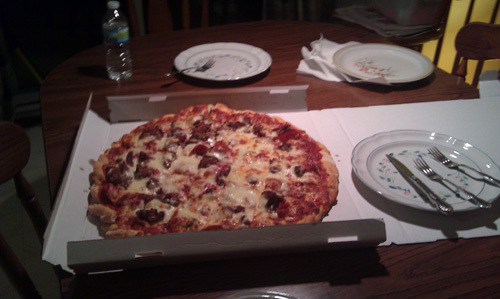 They had some pretty interesting pizza, from the classic Chicago style deep dish to the thinner crusts. (While they even had a sausage patty pizza, which included a full size patty as one of its layers, I stuck with the thin crust pizza.) The most interesting and delicious thing was the crust, which was definitely seasoned well. The restaurant decor itself was pretty interesting. 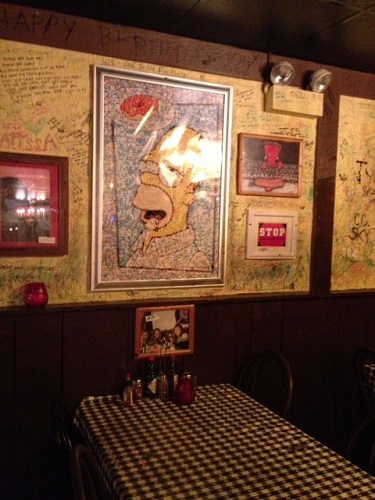 The first thing that caught my eye was the Homer Simpson poster above (made up of individually colored elements, though I forget what they were. Probably scenes or characters from the show). The other crazy thing was that you were allowed to write on the walls. It did provide character to the place. There were a few places that they asked you to not write on the walls, like the bathroom. The sign there said Don’t graffiti here or similar, which of course someone altered to say Don’t gravity here. On Saturday my brother got married in Geneva, IL at Riverside Receptions. 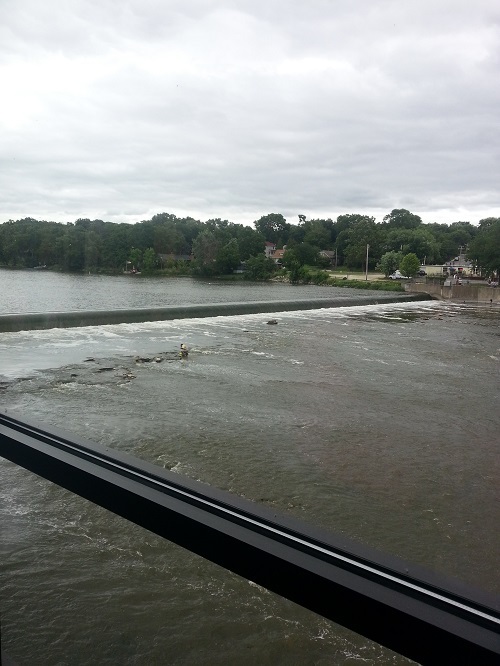 The wedding was absolutely gorgeous, as it overlooks the Fox River. The bride and groom worked very hard to pull this off, and it definitely showed! The pictures that the photography company (Le Cape Weddings) took were very creative and absolutely stunning. 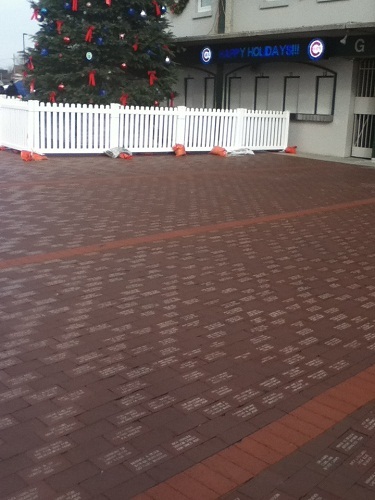 Here is one of the pictures we took while visiting Chicago last Christmas (2011). It was pretty interesting to cross the bridge as you could see the river below your feet at times, especially when you were entering or exiting the bridge. Whenever I see this photo I think of St. Patrick’s Day in Chicago, as they traditionally dye at least one of the rivers green. 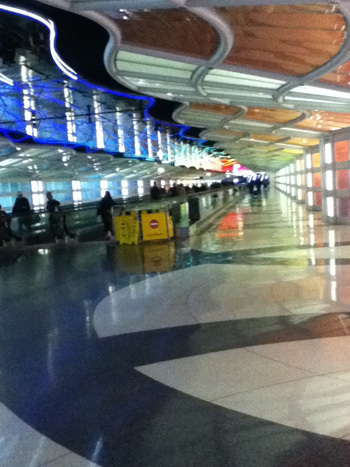 My flight from O’Hare to Newark took off from terminal 1, concourse C of O’Hare airport. 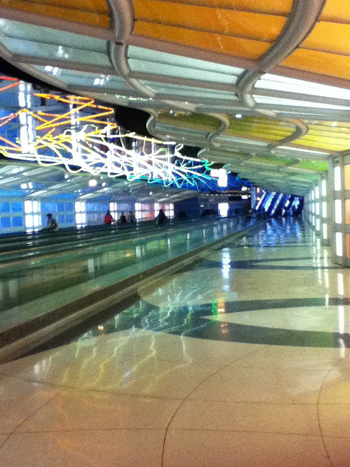 That meant that I had to walk underneath the tarmac from concourse B to C. The tunnel has two long walking escalators, above which is an art installation by Michael Hayden called “Skies the Limit“. Installed in 1987, it is composed of 466 neon light tubes which are white on both ends and a rainbow of colors in the middle. The lights turn on and off randomly in time with music by George Gershwin, whose Rhapsody in Blue (YouTube) was adopted as United Airlines theme in the 60s. YouTube video, with the United Airlines theme music in the background. 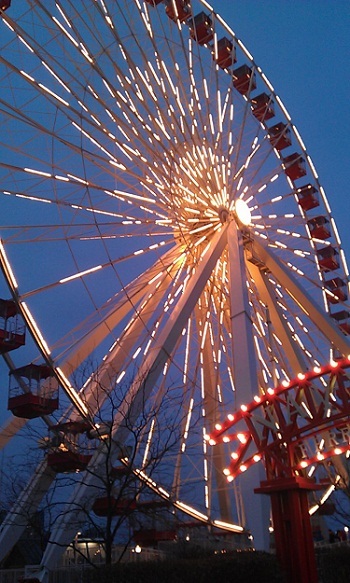 I never had the guts to go on this ferris wheel. It’s taller in person than it looks. 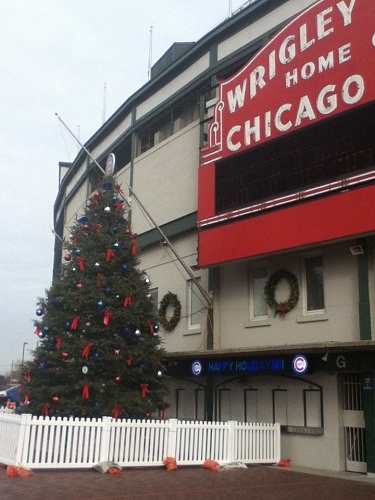 It’s hard to believe that it has already been 11 months since Marco, Roger and I visited Chicago for Christmas 2011. 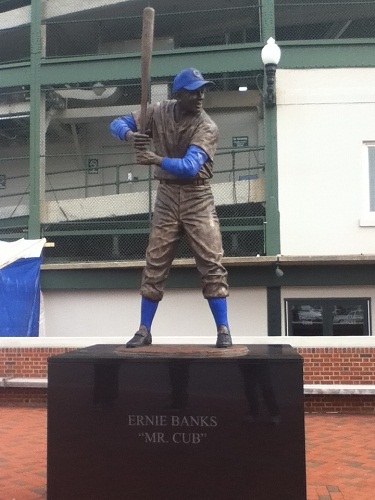 One of the places we visited was Wrigley Field. I actually did go to one game back in the day during college (I forget the team the Cubs were playing) although traffic and parking was horrendous enough that we didn’t get into the stadium until the 5th inning. We also found a pretty decent sporting goods store (Sports World) nearby where Marco and Roger bought some sporting items — one I remember was a Cubs ball cap. This past Christmas, Marco and Roger came with me to meet my parents in Chicago for the first time. The very first night we were there, we ordered pizza. It’s a family sized pizza, since we wanted leftovers the next day (of which there were plenty!). And the pizza made Marco drool. He was reminiscing about it a week or two ago, specifically that the pizza was cut into squares not slices.. If you look closely, you can see the square cuts. Of course, I had no idea that about 36 hours later (give or take a few) I would be engaged. The proposal happened while unwrapping gifts Christmas morning. I really had no idea. Even when someone at church accidentally almost gave it away at the Christmas Eve service… I was totally clueless and said “No…? We’re not getting engaged until later in 2012.” Oh how little I knew. As Marco mentioned, there was a lot of scheming going on. He actually called my parents a month or so prior about the upcoming engagement, and my parents actually wrapped up the ring box in a stocking for the dog. They knew I’d help unwrap the dogs present. And then of course there was also the scheming being done for my mom’s Christmas gift – a new netbook. It was very hard to concentrate on her unwrapping her gift, since I was spending too much time staring at my new ring!